Hot air ballooning entails the pilot riding inside a wicker basket attached to a huge balloon made of rip-stop nylon. The balloon has a burner which is positioned between he wicker basket and the balloon. The flame of the burner heats the air inside the balloon and makes it rise. The degree to which the balloon air is heated depends on the atmospheric conditions, also on how high the pilot wants the balloon to go, and, of course, the fuel. To descend, the pilot allows the air to cool, and with the balloon becoming heavier than air, it loses height. Thus, by controlling the heat in the balloon, the pilot has complete control of the up-and-down movement of the balloon. Once the hot air balloon has taken off, the wind conditions decide its direction. But this does not mean that the pilot does not have control over its course. The different layers of air are usually moving in different directions and the pilot has to move up and down to find a layer that would take him or her in the desired direction. This is where the skill of the pilot comes into play, where, without physically steering the balloon, the pilot controls the direction of the balloon. Hot air ballooning started in the year 1783 when two French brothers, Joseph Michel Montgolfier and Jacques Etienne Montgolfier, created and set aloft a 17.37m high fire balloon from the courtyard of the Versailles Palace. This massive balloon did not carry human passengers but a sheep, a rooster and a duck. After an eight-minute flight, the balloon landed safely 3.2km away from the palace. Later that year, two French noblemen, Pilâtre De Rozier and (Marquis) François Laurent D’Arlandes, mustered up enough courage and became the world’s first human passengers in a hot-air balloon. For over 50 years after that, hot-air ballooning became very popular in Europe but with the coming of the aeroplane, the activity was by and large forgotten. It is only in the last couple of decades, with the development of modern high-output burner systems, that it has once again caught the fancy of adventurers. It was revived in the US but now is fairly popular in Europe and other parts of world. A hot-air balloon has three major parts, namely the envelope, the burner, and the basket. The envelope of the hot air balloon is usually made of over 1000sq.m of rip- stop nylon and is about 50ft wide, 70ft high and 57,000cu.ft in volume. The balloon is attached to the basket by steel wire ropes and the lightweight basket is made of wicker and metal ropes. The burner is positioned above the pilot’s head and the fuel – propane or butane – is carried in a liquid form under pressure in cylinders and routed to the burners by flexible hoses. An average balloon can stay up for as long as two hours and can travel at about 16km per hour depending on the wind conditions. However, there are balloons that are equipped with fuel to enable it to stay up for more than 20 hours. In competitions, rather than the speed it is the balloonist’s navigational skills and his or her ability to read atmospheric conditions that are tested. 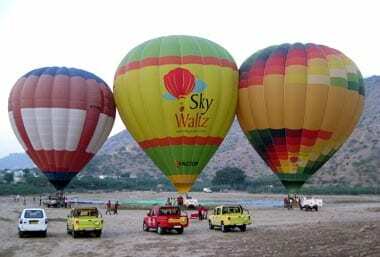 October to March – The mild winter winds make it the ideal time for hot air ballooning in India. The cold air outside helps make the hot air inside the canopy lighter, thereby enabling the balloon to stay afloat longer. 1. During a flight, the balloon is usually followed on the ground by a chase crew. The crew’s job is to be at the landing site when the balloon touches down. Radio contact between the pilot and the chase crew is recommended. 2. 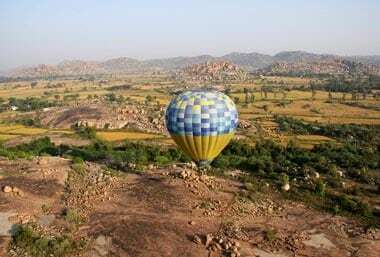 Do get your permits in order as currently permissions are required for ballooning in India. 3. Do not venture out ballooning near defence installations, since this is strictly forbidden. 4. Do not go ballooning during turbulent wind conditions. If the ground wind velocity is more than 8mph/13kmph, chances are that the balloon could get dragged along the ground while it is being filled, and get damaged. 5. Do land on clear, wide-open places – watch out for electricity poles and high-tension wires. 6. Do not smoke near the gas cylinders/burner, or when the balloon is being inflated or in flight. 1. Anybody reasonably fit and not suffering from agoraphobia (fear of heights) can go ballooning. 2. If you are an expecting mother or if you suffer from high blood pressure, a weak heart condition or epilepsy, ballooning is not recommended. 1. We are borrowing someone’s land every time we take off and land, so be very careful not to disturb or damage someone’s property. 2. One of the most important parts of being in a chase crew is dealing with the public. When the balloon is landing, the chase crew asks the landowner for permission to retrieve the balloon.